Messy room, messy mind. Create a space you can feel at ease in by tidying up with our clever storage and organisation ideas for untidy rooms. An untidy room isn’t just unpleasant to look at, it can also be detrimental to your health. A study by St. Lawrence University, New York showed that a messy bedroom can worsen the quality of your sleep and your ability to think properly. If everything is in its place you’ve solved your untidiness problem, and what’s the key to that? Storage! Mounting shelves to walls is an easy DIY job and creates valuable storage space for items that look ok on display, e.g. books, vases, photo frames, baskets and jars of items and even small storage boxes. A shelf is a versatile room accessory that can be painted in colours – and adorned with items – that suit your room’s décor. Without wall-mounted shelving, you are losing out on lots of potential surface area, which will help you tidy up the mess. Follow our easy step-by-step guide to mount a wall shelf: How to Hang a Shelf. Freestanding shelving units (not attached to a wall) are another must-have for a chronically messy room. These movable, versatile and useful pieces of furniture provide lots of space for you to tidy items away on, while taking up little floor space. They also lend themselves well to rented properties, where the tenant might not be permitted to drill into the walls to mount wall shelves. Storage boxes are the holy grail of keeping your home tidy. Anything that is not regularly used should be neatly stored away and protected in a storage box. There is a vast array available in Topline stores. Look for boxes that will slide under beds to utilise that space, and stackable boxes that are ideal for putting out in sheds. Top Tip: Either go for the transparent versions or label them so you can easily find what you have inside when you need it. A laundry hamper is an absolute necessity in every bedroom to avoid piles of dirty clothes on the floor. If like us, you tend not to stay on top of your ironing, you might also want a second one for clean clothes that are waiting to be ironed! Plenty of strategically placed hooks, racks and rails will alleviate lots of the causes of untidyness, such as towels, coats, scarves, etc. They come in screw-in or removable stick-on formats, and both are very easy to install. Wickerwork baskets and upcycled wooden crates make lovely storage solutions, which look stylish and hide a multitude of sins! If you have lots of small items that can’t be thrown out but are always in the way, like spare keys and remote controls, stick them in a basket and put them on a shelf. Top Tip: Use chalk paint to paint old wooden boxes and bring them up to date, making this cheap storage accessory look expensive. Once you have a handle on the chaos, keep a close eye on when and how the mess starts to creep back into the room. You may find that there are good reasons, which can be dealt with. For example, there might be nowhere handy for your housemates or family to leave their jackets when they come in the front door so they just dump them. And then the mess inevitably accumulates. Solution: install some hooks near the door. 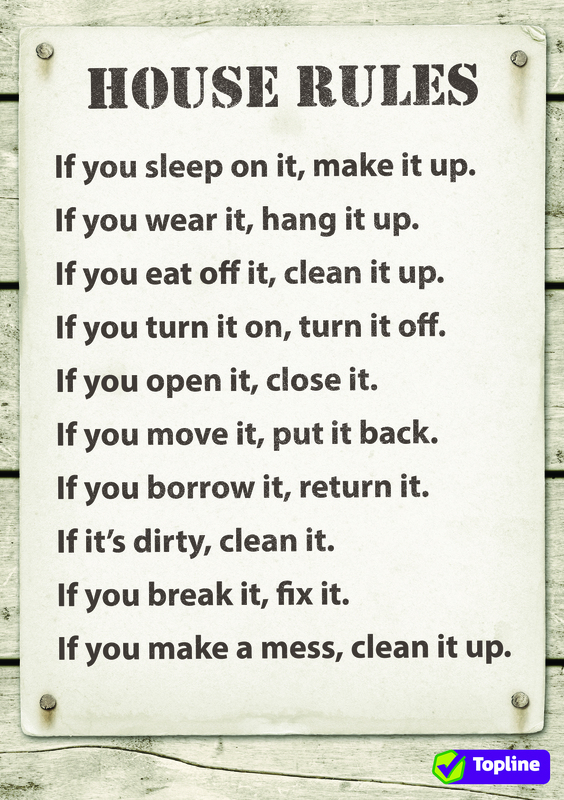 Maybe there are some habits that need to be changed and rules that need to be introduced, like the following which we have here for you to print out and post on your fridge…. Click on the image for a full-size version you can print out. For more information on dealing with untidiness, clutter and a lack of space in your home, see our guide: Space Saving Ideas.